to Margaret Lawrence from Olympia, WA! Congratulations Margaret, we'll be sending your prize out shortly! Thanks to all of you that hang out with us on Facebook, we really do enjoy reading all of your comments! Wow! We received so many entries for our "Name The Mat" contest, it took us longer than expected to go through them all and select a winner! After some deliberation, we finally settled on the name. The winning name was submitted by Nancy Hendel. We had several submissions for the same name, but Nancy was the first to get hers in. The early bird gets the worm! We'll be sending this bag of swag to Patty Swatzell of Madisonville, TN! Congrats Patty, we'll be mailing it out shortly! Stay cool! Get those machines warmed up - it's time for the first contest in our "Summer Sewing Series"! Every few weeks we'll challenge you to make up a fast & fun sewing project. We'll make sure the projects are quick to sew, and can easily be made with fabric we know you already have (admit it, we all have at least a small stash of fabric). When you're done all you'll have to do is email us a picture, and we'll choose the winner! Easy peasy lemon squeezy! 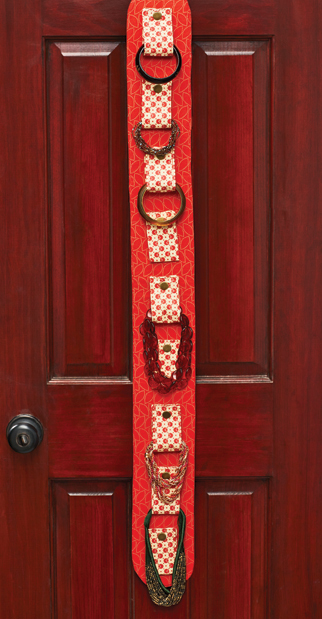 For our first project, how about a jewelry hanger to help you get organized? 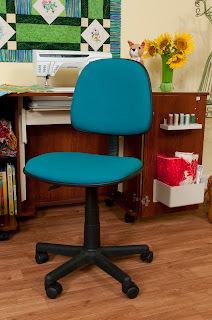 This one is from our friends at Sew It All, but there are tons of free patterns on the internet if you need one! 1. Pick out some cute fabric (it can be recycled from something too), and take a picture of it before you cut it up. 2. 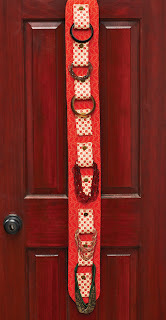 Stitch up your jewelry hanger. Remember to put your own spin on it - we love creativity and color! 3. Take a picture of your finished project and email BOTH photos (fabric and finished project) along with your full name and address to rebecca@arrowcabinets.com by Friday, June 28th at 5 pm Eastern time. 4. The projects will be voted on by Arrow staff, and the winner will be announced here on the blog on Wednesday, July 3rd. Creativity counts!! Please make sure you follow all of the rules! 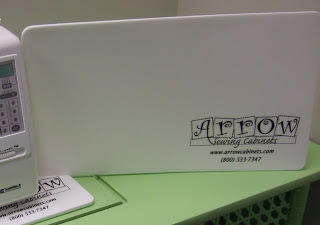 If you have any questions, please feel free to email us at Rebecca@arrowcabinets.com. Our First Swag Winner For June! will help a lucky person plan some of those trips. Patricia Helm of New Hope, PA, we wish you safe and fabric-filled travels this summer! Your prize will be on its way shortly! to Vicki Terpstra of Beloit, IL. What a great way to end the month - congrats Vicki! 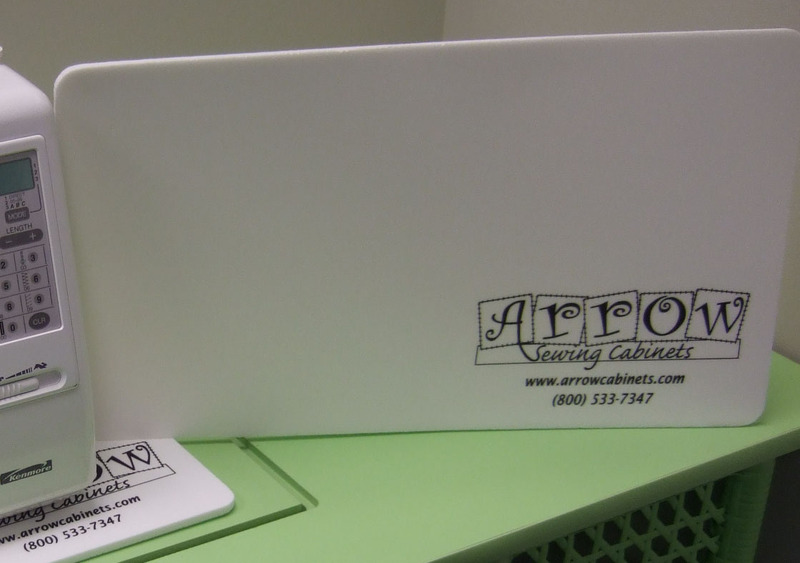 We recently introduced our newest product - a mat that sits under your sewing machine to help reduce vibration and prevent scuffs on your sewing surface. We think it's pretty cool, but we are having a hard time coming up with a name for it! We'd love to hear your ideas, so we're having a "Name The Mat" contest. The winner will receive a mat (of course), an apron, and a green Arrow bag. Please email your name suggestions to Rebecca at Rebecca@arrowcabinets.com by Monday, June 10th at 5 pm Eastern time. We'll announce the winner on Friday, June 14th. In the event that two people submit the same winning name, the email with the earliest time stamp will be the winner. We're looking forward to reading your suggestions!